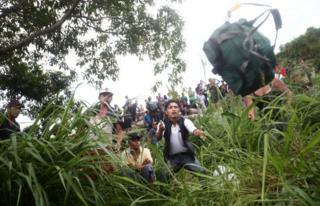 On Friday some tried to force their way across the frontier bridge, reportedly throwing rocks at riot police. 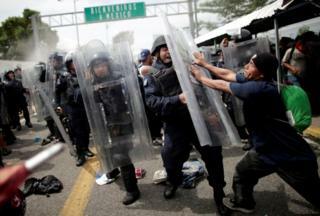 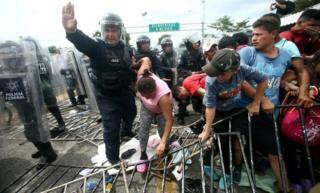 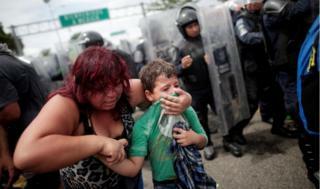 The officers used tear gas to push back the crowd, most of whom are from Honduras. 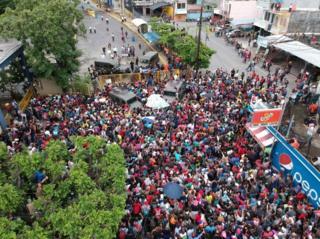 Jari Dixon, an opposition politician in Honduras, tweeted on Monday that the caravan was not "seeking the American dream" but "fleeing the Honduras nightmare". 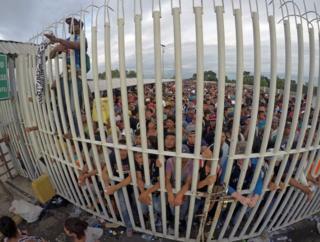 These pictures capture the scenes unfolding on the Guatemala-Mexico border. 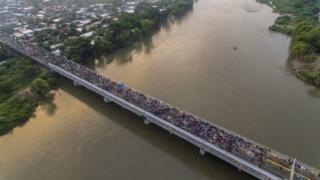 Aerial images show dense crowds at the Guatemala-Mexico international bridge in Tecun Uman, Guatemala. 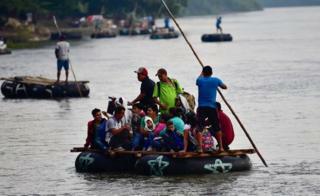 Makeshift rafts carried some across the water, while others swam or waded. 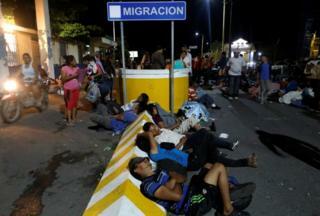 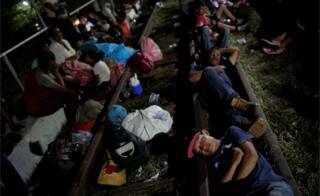 Many are sleeping on the bridge that links Mexico and Guatemala or by the nearby checkpoint. 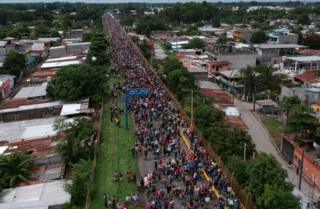 President Trump has threatened to call up the US military and shut the border with Mexico to keep out the group. 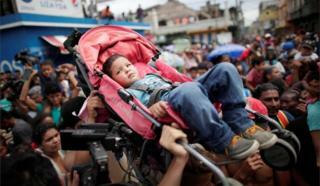 The migrants include many parents travelling with young children. 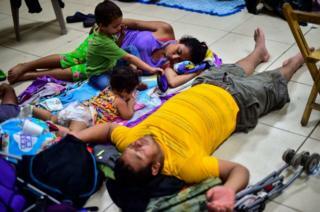 This family spent the night of 19 October at a temporary shelter in Ciudad Hidalgo, Mexico. 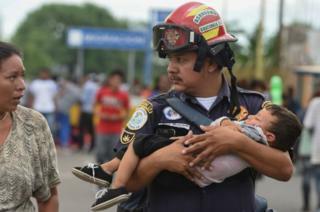 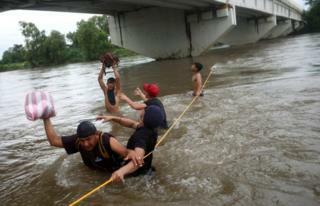 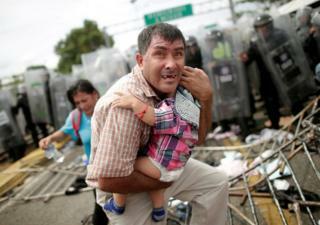 At the border bridge, a Guatemalan firefighter was pictured carrying a sick young boy. 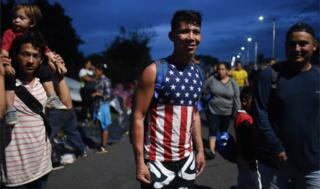 Honduran President Juan Orlando Hernandez has asked permission to send his country's civil protection force to Guatemala to help the migrants. 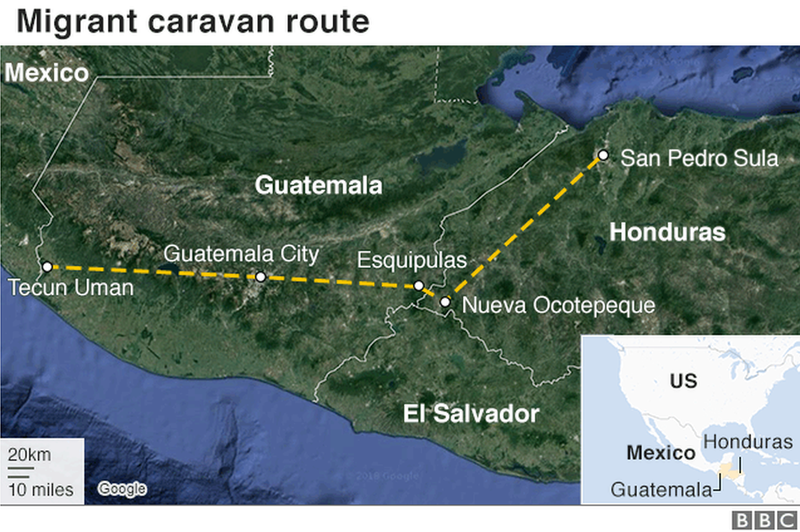 "I also asked for authorisation to hire ground transportation for anyone who wants to return, and an air bridge for special cases of women, children, the elderly and the sick," Mr Hernandez tweeted.